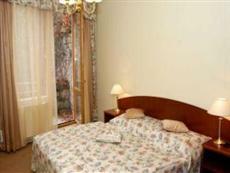 The Petr Hotel Karlovy Vary is located in the heart of the spa district. This provider of Karlovy Vary accommodation also allows guests close proximity to the many museums, cultural attractions and shopping boutiques to be found in this area of the city. The Petr Hotel Karlovy Vary is located approximately 2 hours away from Prague by car. Guests may also opt to take advantage of the Karlovy Vary airport located at the southeast of town. The rooms at the Petr Hotel Karlovy Vary are provided with modern amenities. Guests of the hotel may opt to have a massage service provided in their own quarters. The Petr Hotel Karlovy Vary is a complex of three buildings which are connected via glass corridors. The hotel has its own casino on the premises which offers card games and roulette. The hotel also has its own spa facilities which offer a range of treatments. There are three restaurants located on the premises which serve Russian, Czech and Continental cuisine. The hotel was famously the preferred lodging choice of Czar Peter I of Russia.